She recently recommended that I read The Body Keeps theScore: Brain, Mind, and Body in the Healing of Trauma by Bessel van der Kolk, M.D. The book is satisfying for its historic breadth. Trauma was a subject of interest after World War I, with the experience of “shell-shocked” veterans, but surprisingly understudied until Vietnam veterans presented similar symptoms. Van der Kolk’s long career dates back to the origins of post-traumatic stress disorder (PTSD) diagnoses; he and the Trauma Center have been involved in the subsequent history of understanding and treating trauma. 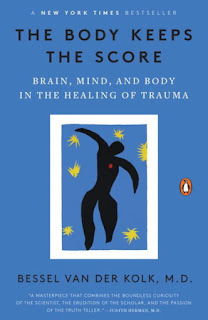 But more importantly, The Body Keeps the Score is written for survivors and those who care for them. Van der Kolk shows how traumatic events actually rewire the workings of our bodies and minds. Trauma can leave one stuck in response modes that may help in surviving an immediate crisis but hinder recovery, moving on and being present, often by instinctual reversion to unhealthy responses. PTSD may endure from a battlefield, or from natural disasters, accidents, violence, loss, neglect, abuse or other traumatic experiences. This book offers a readable and highly informed approach to identifying, treating and living with the effects of trauma. The book is readily available. You can also find it as free unabridged audio on YouTube, where you can also find talks by the author. The Trauma Center has resources listed at www.traumacenter.org.